Everyone knows the story of Peter Pan, right? I think my introduction to the story was the Disney version of the film. Originally, I was just going to write a post about my boys' love and interest for Peter Pan and Captain Hook, but then I thought it'd be an excellent tie-in into this month. Hurrah to both my gorgeous boys for inspiring this blog post. My two boys are absolutely obsessed with pirates and Peter Pan and of swordfighting Captain Hook. We've gone through weeks where all the wanted to do was play pirates and watch Peter Pan films. 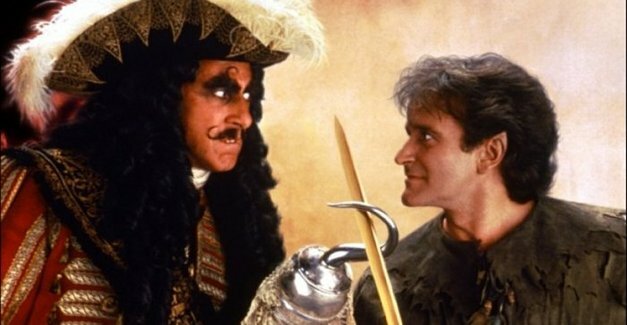 We've watched the Disney film, we've watched Hook and the 2003 live-action film of Peter Pan. After each viewing, of course, the pirate mania just increases. 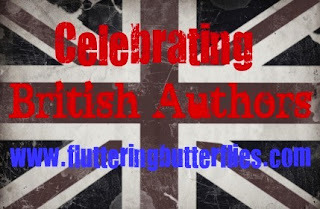 But it is a pretty British story, so I thought it might be fun today to talk a little about it during my British author month. Peter Pan (Disney) - This was my first introduction to Peter Pan, I'm sure of it. I absolutely adore Disney films, and I love this story. I thought this image, of Peter and Wendy and the others flying around London and in front of Big Ben particularly appropriate. Hook - Hook was a firm favourite in our household growing up, I've seen it an endless number of times and still I do not grow tired of it. There's something about an old and overweight (and grumpy!) Peter Pan that makes me laugh. It had that added element of Peter growing up and having responsibilities that makes me a little sad, but also flying and sword-fighting and an amusing fight scene with Captain Hook. Peter Pan (2003) - I've only watched this film a few times however. I think it's adorable and I couldn't take my eyes off of the boy they cast as Peter. Many years after this film was made, he will appear in one of my favourite TV programmes Friday Night Lights and it will take me absolutely AGES to figure it out. My Eldest watched this film and was really taken with it. I remember walking in the hallway while E was in the room and he was sat on the sofa, whispering to himself 'I believe in fairies, I do, I do.' And it was the sweetest thing ever. Finding Neverland - I really liked this film. I've only seen it the once, but I found it to be wonderfully interesting. It was nice to see a bit of background to an author and to the creation of a story that I didn't know very much at all about. Plus I do love a Johnny Depp film. But of course, before all the films, Peter Pan was originally a play written by Scottish playwright and novelist, JM Barrie. 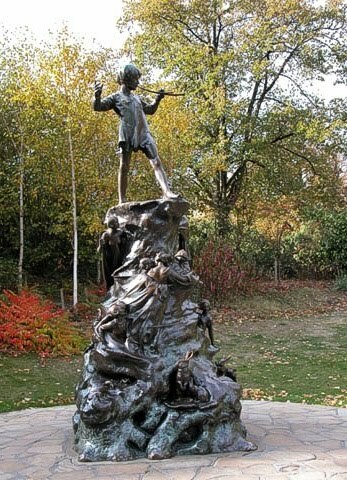 After the success of the play, he expanded the story into a novel called Peter Pan and Wendy. The inspiration of the story stems back to a family of boys he met whilst at Kensington Gardens. 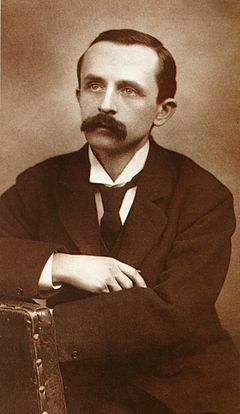 JM Barrie later semi-adopted the boys after the death of their parents. I really loved that the copyright of the Peter Pan story was passed on to the Great Ormond Street Hospital. I hope to soon read the book to my boys at bedtime. And depending on how well that is recieved, we'll read the authorised sequel, Peter Pan in Scarlet by Geraldine McCaughrean, which I read a few years back and remember enjoying. We'll probably even go take a stroll through Kensington Gardens, see the statue, and continue swordfighting and pretend-battling Captain Hook. And believing in fairies, naturally. What a lovely post! 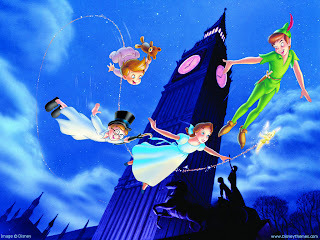 I love the story of Peter Pan, and I enjoyed the Disney version and Hook loads when I was younger. I've never seen the live action Peter Pan or Finding Neverland, I ought to give them a go. Your description of E whispering is so adorable! Brilliant post! I had a pop-up Peter Pan book when I was growing up and I remember it very clearly. It was enchanting, and the pirate ship was amazing! I loved reading this - thanks. I had the Peter Pan Disney picture book as a child and read it repeatedly. Then Hook came out and I was sold. I still smile when ever I go past J.M Barrie's house on the bus (i cried my eyes out in the cinema when I saw Finding Neverland). It's so lovely that 100 years after the book we still love it and your boys too. I love the 2003 version and Finding Neverland never fails to make me cry. I really should read the original novel, to be honest. I'm nuts about Peter Pan. It's my favorite book. I have a hard back copy with all these gorgeous paintings in it, and I treasure it like I treasure no other book. What's really interesting about the story is that it takes on all kinds of new dimensions as you reach adulthood. Peter Pan is described as somewhat of a psychopomp in the book--he takes children who have died part of the way to the afterlife so they're not scared. And in Hook, the thought of being Jack's daddy is what makes him fly again, which is so much more powerful to me as an adult than it was as a kid. It's fabulous in every incarnation. Thanks for the great post! Those are all such wonderful movies. I really liked the 2003 version too. 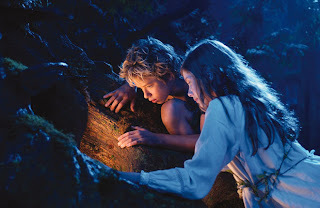 The parts of Peter and Wendy were so well cast! Luisa - Thank you, and oh, I love the sound of that pop-up! Shadowfalcon - Yes, I think that's wonderful as well, how the story has become timeless. Sophie - Yeah, it's strange, I've had the book on my shelves since I was a little girl. I wonder if I still have that copy? Rebecca - Is it? I love things like that. SM - AWW. I love hearing that. And yes, there does seem to be so many different layers to the story that appeal to different people. Fantastic post. Really thoughtful and interesting. Raimy - Thanks :) We do too. The most moving, most magical "Peter Pan" (for me) will always be the annually televised live-action 1950s Mary Martin musical version. She WAS Peter - absolutely - and the music, especially "Neverland", aka "I Have a Home Where Dreams Are Born" is spot-on, lyrical, and very, very evocative. Thanks for all your fine coverage of the world of children's books and authors.